One evening, as my husband and I sat on our front porch, one of our neighbors walked by and called out to us, saying, “I love to see people using their front porch!” He was pointing out a rarity in our neighborhood, despite several homes having beautiful, welcoming front porches. Most of those porches sit vacant and unused. Even ours sits unused more than it should. I think air conditioning has forever changed what used to be a sacrosanct aspect of southern hospitality: gathering on the front porch with friends at the end of a day’s hard work. After all, who wants to sit out on the porch battling mosquitos and suffering from the heat and humidity when indoors is so cool and refreshing, not to mention bug-free? Maybe busyness has also changed how hospitable we are. And I don’t just mean those of us who live in the air-conditioned south. I’m keenly aware of how I let a busy schedule keep me from practicing hospitality. Well, that and a dog who refuses to learn the difference between friend and foe (but that’s a story for another day). How often do I miss out on the blessing of friends’ company because of busyness? Or because I don’t have time to clean my house? Or because I’m not a very good cook. Whether I’m offering hospitality in my home, or letting friends practice hospitality by visiting their home, or whether we take our hospitality on the road and meet somewhere in the middle, hospitality is one of the ways we cultivate and strengthen friendships. It’s also a crucial vehicle for blessing others. Busyness was never an excuse for avoiding hospitality in Biblical times. In 1 Timothy 3 and Titus 1, those who want to apply to be church elders learn that they are to be hospitable. Paul tells the church in Rome to practice hospitality (Romans 12:13), and Peter admonishes the early church: “Be hospitable to one another without complaint” (1 Peter 4:9). One of my favorite stories of hospitality in the Bible comes from Abraham and Sarah. I imagine Abraham and Sarah were busy from sunup to sundown (and beyond), just ensuring their survival. But they invited strangers (sent from God) to rest under their tree, and they fed them – and not just water and yesterday’s bread. I often wonder if their story might have turned out differently had they grumbled about the extra work that day or if they had not given their guests such a welcoming feast. And it makes me wonder how many opportunities we miss by being too hurried or stressed out to offer genuine hospitality. Because of one particularly nasty childhood experience, here’s a promise I can make you: I will never, ever drop by your house unannounced. Of course, cell phones and texting make it all very easy to say I’m stopping by, but even with my closest friends, I have a very difficult time just coming over without scheduling or at least checking with them first. Let me tell you why. My mom and dad and brother and I were on a road trip one summer when I was still in elementary school, and we just happened to be near the town where one of our relatives and his family lived. So we decided to stop by and see them … without any advance word or warning. They were in the middle of painting their dining room, and to this day, I still remember this terrifying image of the wife standing in the plastic-draped dining room screaming at us. Completely unglued, vicious, out-of-control screaming. She ended her rant with, “And now I guess you expect me to cook you dinner.” Well, not only had we not expected any such thing, but I would have preferred for the ground to swallow me up right then and there. I was hoping at least for a hasty retreat back to the car. I honestly don’t even remember if we stayed for dinner, but we stayed long enough to provide the only peaceful moment I remember of that day: my brother and I sitting on their front porch with their children. That experience damaged the relationship between our two families, and it left me with scars and expectations about hospitality that are unrealistic. My house does not need to be in perfect order for someone to drop by. I do not have to have a gourmet feast at the ready. 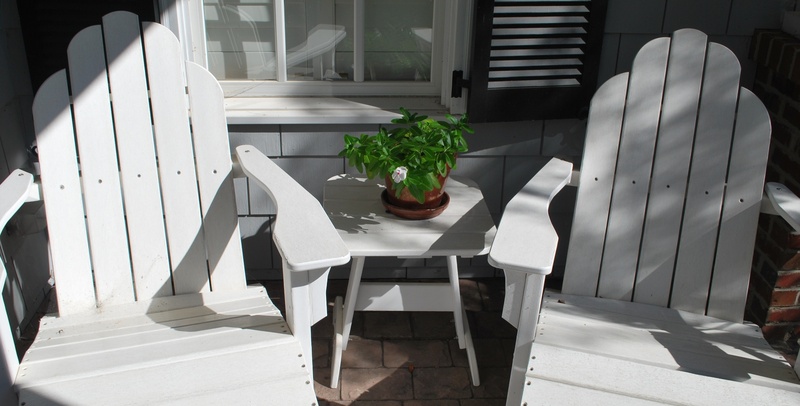 All I need to be hospitable are my presence, a smile, a welcoming attitude and the chairs on the front porch. How do you say, “Welcome”? I’d love to know how you practice hospitality. Are there front porches for gathering in the evenings? Or are they vanishing where you live, too? Do you and your friends meet at a local watering hole that’s like home away from home for you? Are there expectations about what you bring when someone invites you to visit? Or what you must provide when someone visits your home? Finally, whether you’re born and bred into southern hospitality or hail from another region of the country or a different country or continent, what does hospitality mean to you? 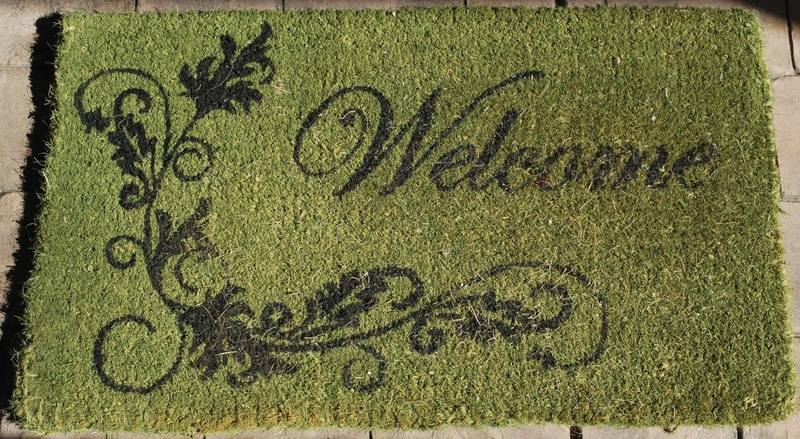 How do you roll out the welcome mat? This entry was posted in flourishing tree and tagged blessings, friendship, front porch, hospitality, welcome by hopesquires. Bookmark the permalink. I’m glad to know there are still neighborhoods where neighbors stop by and chat on their porches. Thanks for sharing your memories — growing up without AC (which I can’t imagine), playing Barbies on the porch and sitting there while your grandmother prepared dinner. How wonderful! Patty — I’m always happy to provide a trip down memory lane … especially a good one like yours. I can just picture you sitting with your dad as the storms rolled through. Thanks for sharing what hospitality looks like for you back then and now. Having a front porch is great! When my sons were little I would sit on the front porch bench and watch them play in the yard. Many times two neighbors who had young children also would join me on the Porch. We spent many afternoons watching the children play, exchanging ideas of parenting, and being a wife and mother. When I was on the porch alone I found this was a wonderful time to talk with God. I was a good listener when I needed to stay seated and watch the children. God knew He had a captive audience. Thanks for sharing this story. I love the idea of your front porch time being a time you spent with God as captive audience.